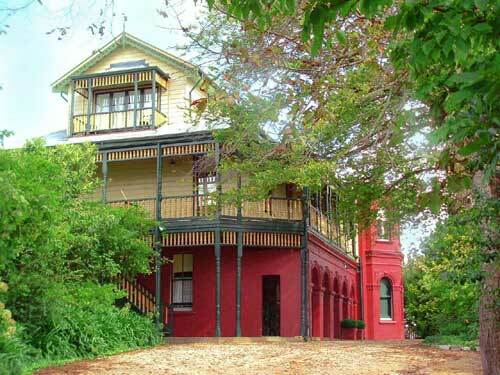 Leura, New South Wales, is blessed with the existence of "Leura House" (C. 1880). This gentleman's residence is a very fine example of late Italianate "Boom" style architecture and is regarded as possibly the finest house in the region. "Leura House" was built in the 1880 s on the highest point of Leura (2,900ft above sea level) and occupies the finest position. It is unique in the area in that it is one of the earliest buildings in Leura and that as an example of Victorian style Architecture it was a forerunner of what might be described as the "Coffee Palace" form of guest house construction in the area. The Italianate style of Architecture arose in Australia around 1870 and was stamped out early in the 1890 s by the 1893 depression. Thereafter architecture was executed in cheaper plainer unrendered and less detailed form of architectural style. Leura House was designed as a house of grand proportions and dramatic Victorian Italianate appearance with a magnificent serpentine carriage way sweeping up from the forecourt landscaped with lawn and shrubs in front of the western aspect of the magnificent and richly decorated colonnaded entrance to the house. The house of the 1880s was one of dramatic appearance. Wide verandahs and unparalleled panoramic views to Mt. Solitary to the South Sydney to the East and Mt. Hay and Mt. Banks to the North and Katoomba to the West. Magnificent chimneys a most pleasing roofline with viewing platform/widows walk was located at the top of the house (where visitors could sit relax and take in the famous mountain air) added to the architectural interest of the house. External Wooden Venetian Blinds were also fitted to the upper bay windows to restrain the western afternoon sun in summer. Leura House was a fine example of Italianate style and correct detail, offset by a fine front colonnade creating overall a very pretty gentleman s country residence. Little history of the house remains but in 1905, three unmarried daughters of John King Lethbridge of "Tregear", St. Marys, opened "Leura House" as a private boarding establishment for 18 people. The house was set in 5 acres of English style gardens planted with mature exotic trees and shrubs to reinforce the character and integrity of the main building. At the turn of the Century there was a house vegetable garden, poultry run and a cow. There was also a cellar and a large water tank on the property. The ground staff were employed to tend to the garden, milk the cow and collect and farewel1 visitors at the railway station in the house 'buggy' as well as carrying out various Kitchen duties such as cleaning the knives before the days of Stainless steel. Domestic and outside staff worked approximately 12 hours each day, 7 days a week. "Leura House" has always been an historically important property in the area and was one of the first properties to obtain a telephone, (Kat.26) and to have gas lighting. The house under the management of the three Lethbridge sisters, became a popular and fashionable Guest House in the Blue Mountains and each year received many guests from overseas and throughout Australia. It was always bright and comfortable and filled with fresh flowers in Summer and heated by eight magnificent wood/coal fires in winter. At the turn of the Century, the Blue Mountains enjoyed many world class tourist facilities and thus became a most popular tourist destination due to its accessibility by public transport and the famous tourist destinations in the area. The three Lethbridge sisters were of vast1y different personalities but complimented each other in running the guest house and maintaining a high standard of hospitality. Mary Isabel (Daisy) took control of the kitchen, Amy Copeland looked after the Dining Room and House and Laura Hannah (Dolly) did the flowers, supervised the garden and was said to be "popular" with the gentlemen visitors of the day. In 1915 the elder sister, Daisy, had a stroke and died, the youngest daughter, Dolly married a local businessman, Mr Harold Renton and continued to live in Leura Arny, the other sister, tried to carry on the house with help but it proved too much for her and the property was then sold. "A well known Mountain Guest House beautifully situated on the highest point of Leura-owing to special construction, delightfully cool and airy. Spacious grounds, electric tight, central to all places of interest, magnificent valley views, hot and cold bath and sewerage. Terms £3.3s per week; 12s 6d per day". The property was sold in 1950 when tourism in the Blue Mountains became unfashionable due to cheaper petrol and an affluent society seeking a wider variety of holiday destinations. "Leura House was purchased by the "Daughters of Our Lady of the Sacred Heart" order of the Catholic Church towards the end of 1950, when the Misses Standish, the current proprietors wished to move to Sydney. The order was living in the St. Mary's Juniorate in Grose Street, Leura and needed to expand their accommodation because of the increasing number of girls applying to enter the novitiate, at what was considered too early an age. It was therefore decided to expand the operation so that the girls could profitably pursue their studies until old enough to enter the Novitiate, if their vocation appeared genuine. "Leura House" served the ideal solution to the problem of the overcrowded St. Mary's and was purchased by the order. The sisters and girls moved to "Leura House" on the 25th January, 1951, and it became known as "Our Lady of the Sacreed Heart" Juniorate. There was no central heating and the inhabitants slept within the house in large dormitory accommodation and on polished wooden and linoleum floored verandahs. December 2nd, 1957 was an historic day for "Leura House" and a day of terror for the village. A fire was lit in the local council tip and it escaped to nearby bushland and quickly swept up into the little mountain township, bringing ruin and total devastation to all in its path. During the preceding months, bushfires had been visible on uninhabited slopes and valleys, but the village life carried on with little concern or fear. The morning of Monday 2nd, started with a hot and strong westerly wind blowing over the mountains. Always a dangerous warning. At Midday, a sister at "Leura House" opened the door to a cellar and noticed that a big fire was dangerously close to the Juniorate and school next door. In fact the fire soon reached the school and the children and teachers were evacuated just as the school caught alight. The children were taken down the hill to the Bathurst Road where passing cars picked them up and carried them to Katoomba and safety. Back at the Juniorate, the sisters and girls fought desperately to keep the fire back from the property, but the eighty tall pines surrounding the terraced lawns caught fire and flames leapt up to the sky with a terrifying roar. There was no water in the taps and everyone was asked to immediately leave the property for their safety. Little was taken except for the "Blessed Sacrament". The sisters and girls left Leura House as the area was being engulfed by flame. Many houses and the state school at the bottom of Britain Street were in flames and the "Chateau Napier" adjacent to "Leura House" was burning fiercely, having caught fire from the school next to "Leura House". The population of Leura was in total shock, women and children were crying and everyone was covered with cinders and ash. The area was in a state of total devastation. The inhabitants of "Leura House" were taken to the Sisters of Charity in Katoomba where they went straight to the chapel and prayed continuously for the Juniorate until 5.00pm. Normally, "Leura House", because of its high eminence, could be easily seen from Katoomba, but because of the thick smoke, the nuns did not know the fate of their home. Various reports reached Katoomba sayi4g that the Juniorate had been destroyed. Sister Gallagher and Sister Benigna of the order returned to "Leura House" in the evening and as they turned the bend beside the smoking ruins of the "Chateau Napier" they found the Juniorate still standing absolutely intact, although everything surrounding the property had been destroyed. Only three houses were left in Britain Street. It was considered by those people in Leura at the time of the "Great Fire" that it was a miracle that "Leura House" was saved. Everyone agreed that "No earthly power could have saved the house" and it was said by the firemen that the fire advanced to the three outdoor statues of "Our Lady of Mary" situated throughout the garden around the house and promptly stopped. Times changed and so did the thinking in regard to the Juniorates as initial centres of formation to religious life. The closed environment of such formation centres was not considered the ideal setting for the development to maturity so basic for the living of a religious life. In 1960 "Our Lady of the Sacred Heart Juniorate" at "Leura House" was discontinued. However, today there are numerous dedicated and competent Daughters of "Our Lady of the Sacred Heart: who trained and developed at "Leura House", carrying out the Congregations Mission in Australia and Overseas. For some years following the closure of the Juniorate "Leura House" continued to be used as a holiday house by the sisters and then it was leased to "Korowal School" in Leura, as its first school residence and subsequently used as a private residence by a local family.